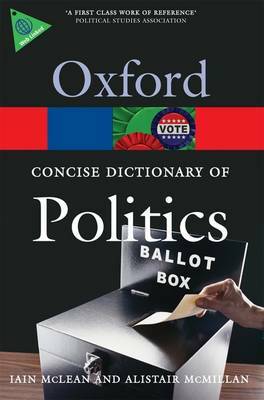 This best-selling dictionary contains over 1,700 entries on all aspects of politics. Written by a leading team of political scientists, it embraces the whole multi-disciplinary specturm of political theory including political thinkers, history, institutions, and concepts, as well as notable current affairs that have shaped attitudes to politics. An appendix contains timelines listing the principal office-holders of a range of countries including the UK, Canada, the USA, Australia, New Zealand, Russia, and China. Fully revised and updated for the 3rd edition, the dictionary includes a wealth of new material in areas such as international relations, political science, political economy, and methodologies, as well as a chronology of key political theorists. It also boasts entry-level web links that don't go out of date. These can be accessed via a regularly checked and updated companion website, ensuring that the links remain relevent, and any dead links are replaced or removed. The dictionary has international coverage and will prove invaluable to students and academics studying politics and related disciplines, as well as politicians, journalists, and the general reader seeking clarification of political terms.